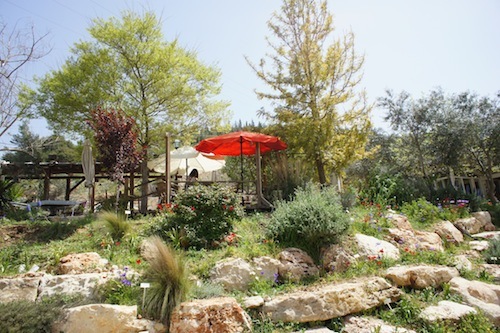 Majda is a hidden gem of a restaurant in the countryside between Tel Aviv and Jerusalem, nestled above the hills of a small town called Ein Rafa across the motorway from Abu Ghosh. On a warm sunny spring day, the thing to do at Majda is to sit in the shaded garden surrounded by trees, flowers and herbs, and simply savor the quiet of the afternoon, looking out over the gently rolling hills dotted with olive trees. I found out about Majda from a BBC documentary called Jerusalem on a Plate featuring Israeli chef Yotam Ottolenghi (who runs a popular restaurant in London) on a visit to Jerusalem’s restaurants and chefs’ homes. The food at Majda is an example of the best of Mediterranean and Israeli cooking. For the starter, we had sardines stewed in fresh tomato sauce with lots of garlic and thick country bread (perfect for mopping up remnants of the sauce). For the main dishes we had spiced meatballs with vegetables and couscous, and wild lettuce stuffed with spiced ground meat, served with a light yogurt sauce and chopped tomatoes. For dessert we chose the almond-pistachio cake — moist, filled with chopped almonds and pistachios, and served with a dollop of sour cream that served as a counterpoint to the sweetness of the cake. 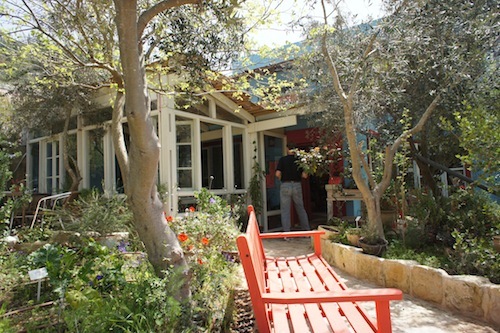 I recommend Majda for those who want to spend a relaxing afternoon or evening in a garden setting enjoying Mediterranean food far away from the busyness of Tel Aviv and Jerusalem. Directions: Take the Highway 1 from Tel Aviv to Jerusalem and exit at Ein Rafa. Follow the signs to the village and when you arrive at the entrance to the village, you will see red lettered signs directing you to Majda (unfortunately, they are in Hebrew). Follow the signs until you reach a gravel parking lot and above it is the restaurant.